There’s a new time capsule buried in the front yard of the University of New Mexico Faculty Staff Club. 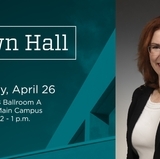 It is a representation of all things UNM from 2015, from a class catalog to notes and poetry from staff members to the future staff of the university. There’s even a menu from the Frontier Restaurant, a frequent haunt of students and staff. The time capsule marks a milestone. The Staff Council has been representing staff and working for improvements in benefits and working conditions since 1990 and has just completed a strategic plan for the next five years. The time capsule is meant to be recovered in 2040 when Staff Council will celebrate its 50th anniversary as an organization. 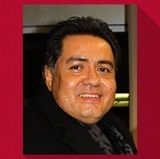 “We hope it will give future staff members a good idea of what life at the university was like in 2015,” said UNM Staff Council President Rene Delgado-Riley. 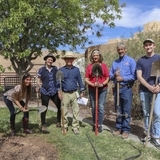 A Rayland Ash was planted to commemorate the 25th anniversary of UNM's Staff Council. Staff Council members also planted a Raywood Ash tree in front of the Faculty Staff Club. The 25 foot tree should mature into a large 40 foot tree that will shade the entire yards. Money for the tree came from the Staff Council Campus Environment Committee collections of spare change. Anyone who would like to know more about the Staff Council and its function at UNM can find information on the Staff Council website.